Homeschooling has grown 27% over the last two years in North Carolina. Dissatisfaction with Common Core may be fueling the growth in homeschooling. Genevieve Wood, “In One State, More Children Homeschool Than Attend Private Schools. Why That Shouldn’t Shock You.”, The Daily Signal, September 08, 2014. 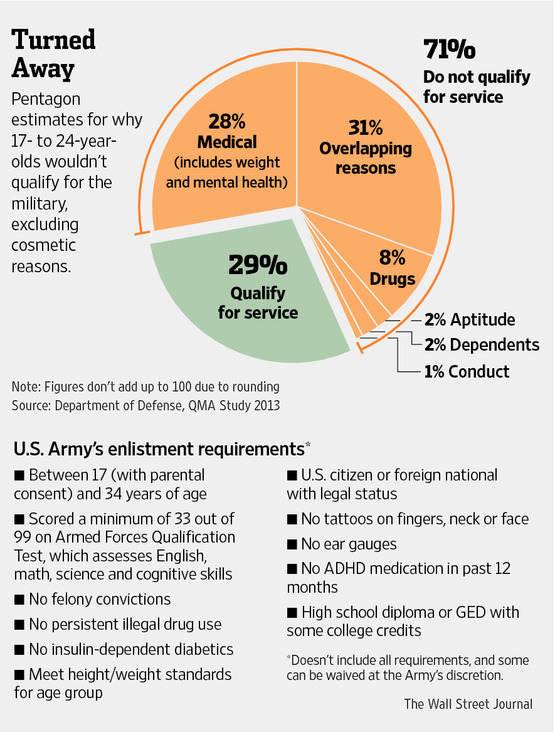 Do you think enrolling in the military after high school might be a viable option instead of college? Think again. More than two-thirds of America’s youth would fail to qualify for military service because of physical, behavioral or educational shortcomings, posing challenges to building the next generation of soldiers even as the U.S. draws down troops from conflict zones. Obesity is the biggest reason, but rejection can take many other forms. Tattoos have become so common that I would not be surprised to see that rule change soon. Miriam Jordan, “Recruits’ Ineligibility Tests the Military”, Wall Street Journal, June 27, 2014. Public colleges and universities have shifted their financial aid priorities away from need-based to merit-based awards. Low-income students are feeling the brunt of this change, but pressure on schools to admit only college-ready students and to raise revenue will probably cause this trend to continue. Public colleges are turning away from their mission to offer access to an affordable college education for all students. A ProPublica analysis of new data from the U.S. Department of Education shows that, from 1996 through 2012, public colleges and universities gave a declining portion of grants—as measured by both the number of grants and the dollar amounts—to students in the lowest quartile of family income. That trend continued even though the recession hit those in lower income brackets the hardest. Universities feel the dual pressures of raising their revenues and ratings. “For some schools, they’re trying to climb to the top of the rankings. For other schools, it’s more about revenue generation,” said Donald R. Hossler, a professor of educational leadership and policy studies at Indiana University at Bloomington. To achieve those goals, colleges use their aid to draw wealthier students—especially those from out of state, who will pay more in tuition—or higher-achieving students, whose scores will give the colleges a boost in the rankings. The math can work like this: Instead of offering, say, $12,000 to an especially needy student, a college might choose to leverage its aid by giving $3,000 discounts to four students with less need, each of whom scored high on the SAT and who together will bring in more tuition dollars than the needier student will. The student profiled in the Chronicle of Higher Ed article offered a clue to the reason many low-income students are losing out. They are academically unprepared for college-level work. That score is below the College Board SAT College and Career Readiness Benchmark, indicating a lack of “skills and knowledge that research demonstrates are critical to college and career readiness”. The same low SAT scores that disqualify some students for merit aid also signal they are at high risk for dropping out of college. Problem should be addressed before the college years. 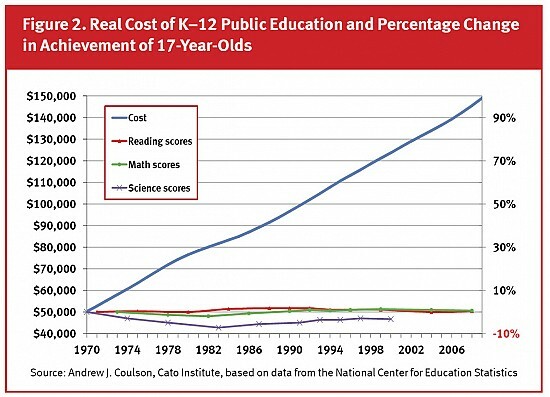 The answer is not to give more need-based aid to students who are not prepared for college, but to do a better job of educating students to be college and career ready. That is the job of K-12 education and community colleges. We know there is a disparity between the amount of homework teachers assign and the amount of homework students actually do. Here are some numbers that illustrate that difference. HOW MUCH HOMEWORK IN HIGH SCHOOL? Admittedly, this data probably does not show fully accurate numbers. For one thing, six years separate the times when the two different surveys were conducted. Plus the information is self reported, so some error is likely for that reason. Still, I’m willing to accept that it reflects what goes on in real life. 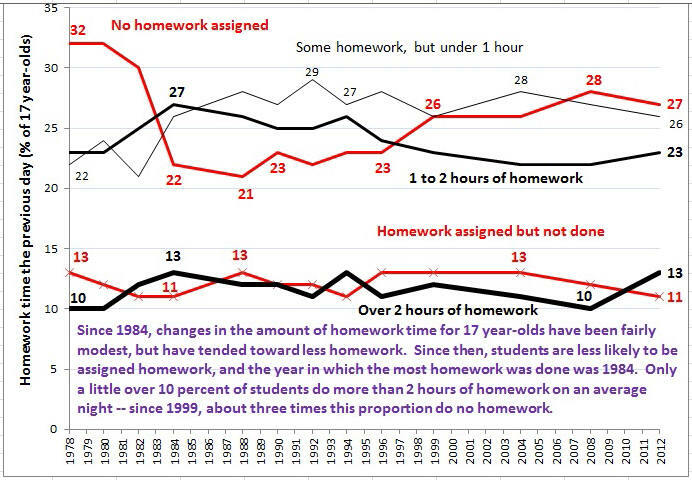 On average, students complete about half of the homework assigned by their teachers. On average, students spend about half the time expected by their teachers in doing their homework. 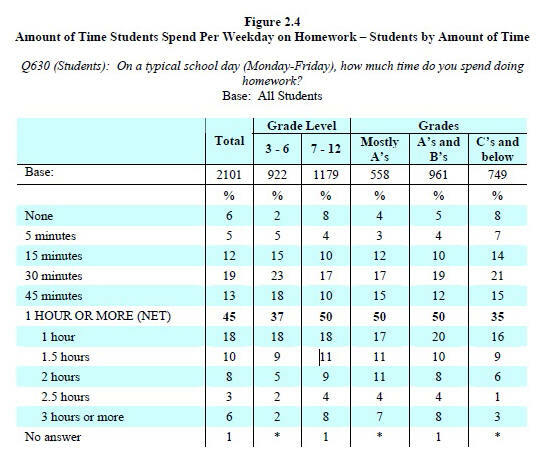 Teachers cannot always accurately predict how long it will take their students to complete assigned homework. And clearly there are slacker students who simply don’t do their school work. Another element is the cynicism about the value of homework, sometimes prompting both parents and students to ignore some assignments. This anonymous comment from a teacher captures some of the reasons for the cynicism felt by families. Funny I was just thinking about this and other things we do in our school to satisfy parents who want their kids “busy” . I teach kindergarten and we give homework! We do it so the After School workers have something to do with the kids. Most of our kids don’t go straight home they go to daycare or After School so rather than have them do unrelated work we send work for them to do. 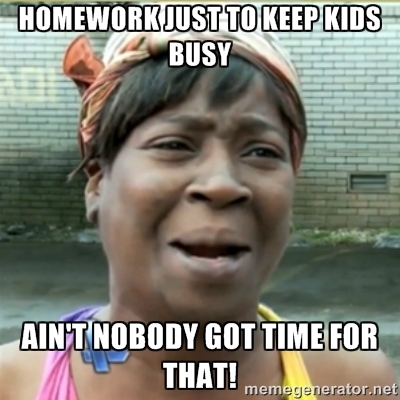 I don’t think homework is necessary and find that many teachers use it as an abdication of their own teaching. Many teachers, for example, will tell parents to practice reading sight words because their child is not learning to read in school. Right there parents are made responsible for teaching their child to read. Parents often made to feel guilty about their child not learning. This is just one example of how homework turns into school work. I spiral the work so it’s always something the kids can do independently. We have been told as teachers that homework is to teach self discipline but it’s really to show the parents that their kids are doing something in my school. Some homework is just for show? Passing Algebra II in high school used to be a reliable indicator of college readiness, but not anymore. … taking and successfully completing an Algebra II course, which once certified high school students’ mastery of advanced topics in algebra and solid preparation for college-level mathematics, no longer means what it once did. The credentialing integrity of Algebra II has weakened. This is the conclusion reached by Tom Loveless in his recently released Brookings report, The Algebra Imperative: Assessing Algebra in a National and International Context. Pushing more students to take higher level math courses has resulted in an increase in students completing Algebra II. 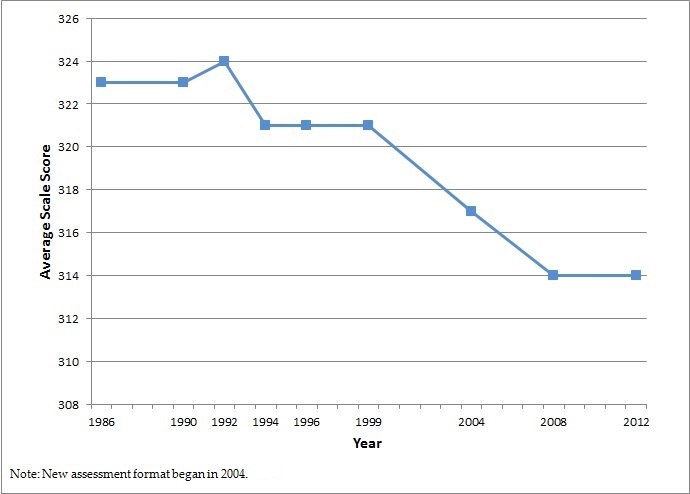 Look what happened to test scores over the same period. Research indicates too many unprepared students are being pushed to take advanced math. Foundational problems begin in elementary school, and by middle school many poorly prepared students are enrolled in Algebra I. California recently abandoned its ill-advised experiment of requiring algebra for all eighth-graders after finding that aggressively pushing low achievers into higher-level middle school math courses hurt their likelihood of math success in high school. In the end, the transition to college unmasks the charade…. Students graduate high school unprepared for college-level math. … students are taking advanced, college-prep courses, passing them with good grades, and yet do not know the advanced subject matter signified by the titles of the courses they have taken…. The 2005 National Assessment of Educational Progress (NAEP) High School Transcript Study (HSTS) found that high school graduates in 2005 earned more mathematics credits, took higher level mathematics courses, and obtained higher grades in mathematics courses than in 1990. The report also noted that these improvements in students’ academic records were not reflected in twelfth-grade NAEP mathematics and science scores. Why are improvements in student coursetaking not reflected in academic performance, such as higher NAEP scores? “Counterfeit” math courses hurt students and waste resources. As unprepared students flow through a series of counterfeit courses, the entire curricular system is corrupted. Algebra II teachers are expected to teach mathematics to students who passed Algebra I with good grades but who, in reality, have not mastered elementary grade concepts that are fundamental to understanding algebra. Parents get false signals about how well their sons and daughters are prepared for college. Schools misallocate resources dedicated to remedial programs by assuming that students know material that they, in fact, do not know. It is estimated that half of four-year college freshman take remedial classes. In the end, the transition to college unmasks the charade. In California, the California State University System draws students from the top one-third of graduating seniors. In 2012, about 30% of entering freshmen taking the Entry Level Math test failed the exam and were placed in remedial math classes, despite earning a mean GPA of 3.15 in college prep high school programs. That doesn’t make sense. Good grades in tough courses, yet remediation was needed. The problem is not confined to California. Nor is it limited to mathematics. A report from the National Center for Public Policy and Higher Education (NCPPHE) estimates that about half of all four-year college freshmen must take remedial classes…. More testing could help? Loveless suggests that having high school students take Algebra I and II computerized adaptive tests, which permit “accurate assessments at varying levels while lessening test burden from excessive questions”, could be a way to begin to restore the “credentialing integrity” of these college prep courses.